Brazilian prosecutors have filed corruption charges against President Dilma Rousseff's electoral strategist. Joao Santana was widely seen as the architect of Ms Rousseff's 2010 and 2014 election victories. 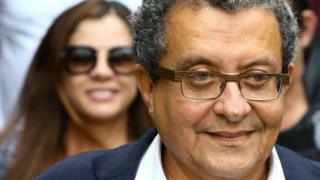 He has denied receiving bribes in a scheme to divert funds from the state-run oil company Petrobras. About 50 Brazilian politicians, including the leader of the lower house of Congress, are under investigation in the Petrobras corruption scandal. Mr Santana is accused of receiving bribes from several large engineering conglomerates. Analysts say the charge against him is a further blow for President Rousseff who is facing impeachment proceedings. He was arrested in February after he returned from the Dominican Republic, where he was working on the re-election campaign of President Danilo Medina. Because of his proximity to her, the arrest is expected to damaged her standing further, even though impeachment proceedings against her are not related to the Petrobras corruption investigation. A former journalist, Mr Santana is well known for producing dramatic, big-budget campaign videos appealing to poorer voters. Mr Santana had called the accusations "unfounded". And he had harsh words for the investigation, saying that Brazil was currently living in a "climate of persecution". If the investigating judge accepts the allegations against him, Mr Santana will be jailed. In Brasilia, a special Senate commission has begun hearings ahead of a vote on whether the whole Senate should take on impeachment proceedings against President Rousseff. A plenary Senate vote is widely expected to take place around 11 May. Across the country, pro-government supporters blocked major roads in cities in nine Brazilian states during Thursday's morning rush-hour to call for the halt of impeachment proceedings against President Rousseff. In Sao Paulo, the city saw hundreds of kilometres of traffic jams which formed behind roadblocks of burning tyres.